Over the years I have been asked about different approaches to the creative process. Questions come up like “where do you get your inspiration.” The short answer is a little bit of “everywhere” and from inside. The long answer is that there’s a pretty involved process. The thing is, everyone has their own ways of going about building a creative lexicon. If you are curious or interested in taking on some of your own creative pursuits, these are some great ways to approach the creative process in different ways. I encourage you to mix it up, or add or omit your own ideas. 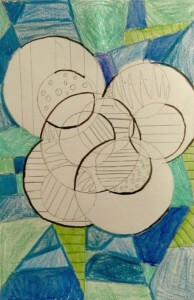 Want to stricture your art around a sphere? How about a square or triangle? Maybe a figure 8? How much positive/negative space do you want to include in your artwork? Plan and plan some more. This is pretty much Art school 101 right here. It’s tempting to use all of the paints in the paint box at once (and sometimes that ok). However It’s best to build a base of an image around 1-3 colors max. A few touches of a contrasting color can be fine as well, but only as a highlight. 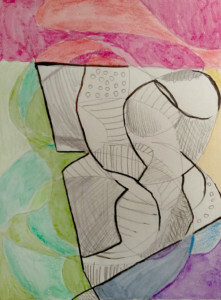 There are many ways one can approach design when creating abstract art. The more intentional you are about mapping our your ideas and choices, the more unique your work tends to come across to viewers. I tend to prefer gestalt theory. Think about how much, or how little you want the viewer to experience while looking at your art. I have a tendency to go very maximal with my designs. This is generally a reflection of the way my brain works, as well as the kind of experience I like my viewer to have. What choices you make in this regard are up to you. This is where a lot of sketching and research come in handy. Thinks about shapes, patterns, lines, etc. Also think about empty space vs. non empty space. I also tend to think about how I set up layers in my artwork. Mapping out ideas throughout the process will always result in a visually richer final product. It will build a unique vision. Plan, test, and repeat. Consider your emotional state, how would that look? When I was in Art School I rebelled somewhat against the notion of falling back on pure emotional expression. I know this is counter intuitive for an abstract contemporary painter. My attitude was “oh anyone can do that.” To a degree that’s true. What is also true is it takes someone making a lot of thoughtful consideration to approach that process effectively. To me this is always what separates good art from amateur art. Did you just eat something spicy or sour? How would you express that in simple or complex terms? The thing is it can either literally communicate an idea or express it in an abstract fashion. Improvise and don’t fear making mistakes. You can always learn something cool and new when you use mistakes as a tool to find success. What artists inspire you? Is there anything about their work that you could see gaining influence from? There’s a sort of idea in art that there is no wrong way to do something. This is true… to a point. The more you create artwork, and get input from your creative peers, the more you grow and evolve. Every artist will always have a struggle with processing creative feedback. It’s perfectly natural. There is a huge difference between constructive feedback and negative feedback. It takes time and patience to know the difference.